Ten years ago, I was very much into IPv6. I had two different tunnels, and all of my home network had v6 IP addresses -- all statically assigned, with working reverse DNS. Even the Windows XP machines. Then I got lazy. I swapped out my hand-crafted OpenBSD router for an off-the-shelf wireless router. That old homemade router was old enough that I couldn't put a Wifi card in it, and I just wanted some wifi. For a couple of years now, I've noticed that Comcast has been giving me an IPv6 address, but I haven't really been able to figure anything out with it. When I was using an Apple AirPort Extreme, turning on IPv6 would break everything. So I just left it off. Even when I was running pfSense, I saw it, but I spent so much time accidentally breaking pfSense that I never got to look into it any further. Since I'm a few months into OPNSense now, and things seem to be rock solid, I decided to have another go at IPv6. What follows are the steps that I took to get IPv6 up and running as expected on my home network. Comcast residential cable internet service -- not a business class connection, and no static IPs. ARRIS Surfboard SB6141 Cable Modem. I bought this myself, and I am very happy I did. I used the Comcast rental for a couple of years. The difference is amazing. OPNsense 15.7.8-amd64. My OPNSense box is built out of random old parts. Nothing amazing, but ample for what I need. Since I installed OPNSense, I noticed my WAN interface has had an IPv6 address. Comcast is handing it to me via DHCP6, which I think is the default setting in OPNSense. I didn't want to NAT for an IPv6 connection, since it defeats the purpose of IPv6. Honestly I didn't even try. In the end, here is what I did to get it all working, with each of my home machines assigned a public IPv6 address. I think that IPv6 is enabled by default, but just to be sure, go to Settings -> Networking, and make sure that Allow IPv6 is checked. If it isn't, then check it. 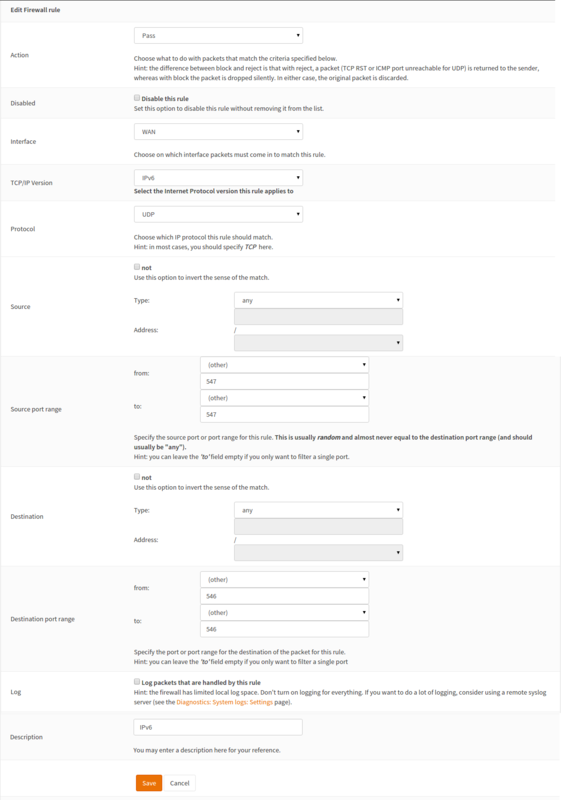 Start by looking at the settings for your WAN interface (Interfaces -> WAN). It should be set to DHCP6 for IPv6 Configuration Type. Scroll down a bit, and find the DHCP6 client configuration. Change the DHCPv6 Prefix Delegation size to 64. Leave all of the other client settings at their defaults. Click save, and apply the changes if prompted to do so. The next step will be to go over to the LAN settings (Interfaces -> LAN), and make a couple of changes there. Start by setting the IPv6 Configuration Type to Track Interface. 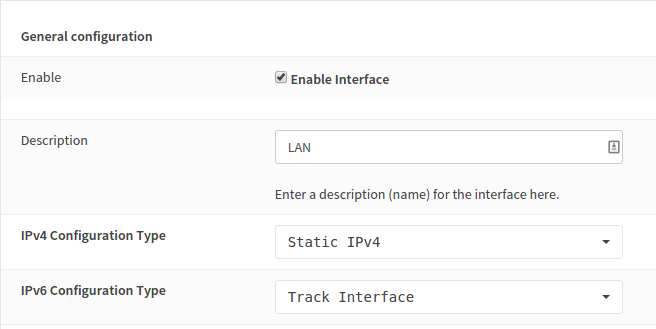 Scroll down to the Track IPv6 Interface section. Verify that IPv6 Interface is set to WAN, and that IPv6 Prefix ID is set to 0. Click save, and apply the changes if you are prompted to. Once that is applied, you should pretty quickly see that your LAN interface has an IPv6 address. In my case, the LAN IP and the WAN IP seem to be on different subnets, specifically, the WAN address starts with 2001: and my LAN address starts with 2601:. In my case, this did not matter. Adding in a firewall rule. When I got to this point, I thought that I was golden, but none of my internal machines would grab an IPv6 address. I was able to ping ipv6.google.com via OPNSense's diagnostic tools. I was missing the final piece of the puzzle, a firewall rule to allow DHCP6 traffic to pass through. This rule, once applied, will allow DHCP6 to come into the LAN from the outside network. At this point, I also rebooted OPNSense, but that probably isn't necessary. Not too long after OPNSense came back up, pretty much all of my internal machines had IPv6 addresses..
Google IPv6: This only works from an IPv6 connection. If I recall correctly, you will get 404 or some other error if you browse there from a v4 address. The Kame Project: If you browse there from a v6 connection, the turtle at the top of the page will be swimming. If it is not moving, then you have connected from a v4 connection. Comcast IPv6 tests: This will fire off off some tests. IPv6 Port Scan: Every time I make a change to my firewall, I like to use Steve Gibson's Shields Up port scanner to make sure that the changes work as I expect. It appears that GRC doesn't yet support v6. But the one I linked up there does. Because of the way IPv6 works, you'll be testing your ocal machine, but it should still be protected by OPNSense, so it should result in all greens, unless you've opened up some ports.